View Snowy River Basin in a larger map (opens new window). Tributary of the Brodribb River. 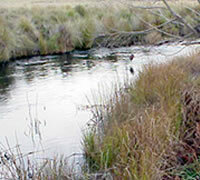 A small freshwater creek containing short-finned eel, long-finned eel, river blackfish, congoli, brown trout, shorthead lamprey and Australian smelt. A small creek which joins the Murrindal River shortly upstream of the junction of that river with the Snowy River. Contains short-finned eel, brown trout to 350 g, and rainbow trout to 200 g. Possibly other fish species are also present in this creek. 10 ha. Also called Beadle Lake. Surrounded by forest, sand bottom. Access is from an unmarked track off the Corringle Beach Road. The lake is crystal clear and 4 m deep and contains short-finned eel and long-finned eel, flathead gudgeon and southern pygmy perch. Stocked by Fisheries Victoria with trout (1959-67). Flows through forest, gravel substrate. Low flow makes much of the middle and upper reaches unsuitable for trout during the summer months. Lower reaches have been subject to some sedimentation. Contains brown trout to 680 g, average size is much smaller, some redfin, abundant river blackfish to 150 g, and short-finned eel. Trout spawning success varies from year to year but seems adequate for the current fishing pressure. Last stocked with trout by Fisheries Victoria in 1980. Flows through forest upstream with farmland downstream, rock, sand and mud substrate. Width to 5 m with water depths average 30-100 cm in different locations and pools to 150 cm. Has narrow deep sections as well as wide, shallow, fast-flowing areas. Accessible at a number of places from the Bonang Highway. No accommodation or camping ground in the area. A small stream that can be affected by low summer flow. Difficult to fish because of overhanging vegetation. Carries abundant brown trout, some to 700 g, small rainbow trout, river blackfish to 350 g, redfin, East Gippsland spiny crayfish and short-finned eel. Condition of fish varies from year to year. Considered a good trout stream. Last stocked with trout by Fisheries Victoria in 1980. Flows through partly cleared forest. Very wide (35 m) in the lower reaches with a sand and gravel substrate. Extensive runs to 100 cm deep and pools to 250 cm. Generally stable banks with undisturbed native riparian vegetation and good habitat. Some erosion in the areas cleared for agriculture. Willow control is being carried out as part of the River Health Program. Accessible from the Bonang Highway and camping is possible in some areas along the river. Contains a very large number of fish species. Carries predominantly brown trout, av. 300 g, max. 1.4 kg, particularly in the Goongerah area, Australian grayling, river blackfish, congoli, long-finned eel, estuary perch, Australian bass, pouched lamprey, shorthead lamprey, southern pygmy perch, flathead gudgeon, common galaxias, Australian smelt and goldfish. The trout are usually in good condition and the best fishing is usually in spring and autumn with live bait. This water is only lightly fished and could support heavier fishing pressure. Last stocked with trout by Fisheries Victoria in 1969. Also called the Cutthrough. Degraded habitat downstream of the Princess Highway with bank erosion and sedimentation. Brown trout, estuary perch, Australian bass and rainbow trout to 1.3 kg often taken in the brackish water. Estuary water providing good black bream fishing throughout the year. Mullet can be caught during the summer, with good catches at times of luderick, estuary perch, trevally, Australian salmon, mulloway, short-finned eel, long-finned eel, dusky flathead and tailor. Flows through forest in the upper reaches and cleared land near Buchan. Willow and weed control is being carried out. In this locality, the river is 20 m wide, with riffles to 60 cm and pools to 200 cm deep. Rubble, gravel and mud substrate. Low summer flow and water level. Carries abundant brown trout, mostly 220 g, some to 700 g, short-finned eel, long-finned eel, congoli, occasional river blackfish, shorthead lamprey, mountain galaxias, common galaxias, climbing galaxias, a healthy population of Australian grayling and some Australian bass in the lower reaches. Best fishing is in the more remote areas reached by 4WD. Winter closures apply on most of these tracks. Last stocked with trout by Fisheries Victoria in 1978. Narrow creek flowing through forest, mostly mud substrate with some gravel patches. Carries abundant brown trout to 310 g, (av. 170 g) short-finned eel, long-finned eel to 750 g, and climbing galaxias. Last stocked with trout by Fisheries Victoria in 1969. Small clear stream, sand and silt substrate with extensive bank cover. Some sedimentation has occurred. Surveys in 1994 found only small numbers of fish. Contains both species of eel, Australian bass, river blackfish, congoli, southern pygmy perch and common galaxias. Lower section is brackish estuary with estuary perch, black bream and luderick. 160 ha. 1,480 ML. A Game Reserve and more popular for duck hunting, during the prescribed season, than fishing. Very shallow estuarine lake surrounded by cleared land. Accessible by boat from the Snowy River and by vehicle through private property. Most of the lake is too shallow for boating. Carries common galaxias, estuary perch, and short-finned eel in a freshwater inflowing creek. Also black bream, mullet, estuary perch, and luderick. A tributary on the east side of the Queensborough River. Contains brown trout to 350 g, Australian grayling and reported to carry an occasional rainbow trout. Last stocked with trout by Fisheries Victoria in 1975. 160 ha. A Game Reserve open to duck hunting during the prescribed season and best not fished at this time. Shallow estuarine lake surrounded by cleared land, mud bottom. Vehicle access restricted by private property but there is boat access from the Brodribb River. Contains estuary perch, sea mullet, and short-finned eel. Fish numbers and condition together with population composition can vary widely with the season. Flows through forest then farmland downstream, gravel bed with some sand. Channel 8-15 m wide with runs 30-70 cm deep and pools to 160 cm. Carries some brown trout to 350 g, but is a disappointing trout stream. Only lightly fished, mainly by local anglers. Also carries congoli, both species of eel, river blackfish, Australian smelt and common galaxias. Last stocked with trout by Fisheries Victoria in 1969. Flows through open grazing land in New South Wales and forest in Victoria, sand and silt substrate in some areas, otherwise gravel bed. Carries brown trout to 1.3 kg, (av. 180 g) and reported to carry some rainbow trout. Provides good angling and only lightly fished. Last stocked with trout by Fisheries Victoria in 1969. Tributary of the Brodribb River. A small creek accessible from the Bonang Highway. Carries congoli, small brown trout, short-finned eel, long-finned eel and Australian smelt. A small river flowing through partly cleared forest and reaches the Snowy River via a massive and rugged gorge. Width above the gorge is 2-8 m, with runs 40-70 cm deep and pools to 180 cm. Substrate is rock, boulders and rubble. Low summer flow and water level. Access is limited and local knowledge is an advantage. Carries abundant brown trout to 700 g, (av. 180 g), river blackfish to 100 g, short-finned eel and Australian smelt. Only lightly fished and sufficient spawning occurs in the stream to support the fishery. Last stocked with trout by Fisheries Victoria in 1983. Shallow river flowing through forest and cleared land, rock and gravel bed. Low flow and water levels in summer. Some willow control is being carried out. Very limited vehicle access. Carries some brown trout, congoli, river blackfish, Australian grayling, short-finned eel, common galaxias and Australian smelt. Not a good angling water. Last stocked with trout by Fisheries Victoria in 1974. Rises in forested mountains and flows into the Bendoc River. Stream badly silted in some areas following forestry activities. Abundant brown trout, av. 140 g, max. 700 g, river blackfish, av. 80 g, max. 400 g, small redfin, and short-finned eels. The river blackfish population is considered one of the best in the area. Sufficient trout spawning occurs in the stream to maintain the fishery. Last stocked with trout by Fisheries Victoria in 1978. Tributary of the Brodribb River, clear water with pools and riffles, rubble, bedrock, gravel and boulder substrate. Extensive overhanging bank cover. Accessible by 4WD track off the Bonang Highway. Contains river blackfish to 100 g, brown trout to 300 g, congoli, short-finned eel and a spiny crayfish species. Tributary of the Brodribb River and similar to the Rich River (above). Contains river blackfish to 100 g, congoli, a spiny crayfish, short-finned eel, long-finned eel, common galaxias, southern pygmy perch and reported to also contain some very small brown trout. Tributary of the Snowy River. A relatively large river (8 m wide) flowing in natural forest within the Snowy River National Park. Mostly gravel and rubble substrate with good instream cover. Extensive riffles 40 cm deep with pools to 200 cm. Accessible by vehicle only at one point near its junction with the Snowy River. Has not been fished extensively but surveys reveal abundant brown trout, short-finned eel, long-finned eel, river blackfish, East Gippsland spiny crayfish and abundant mountain galaxias. Tributary of the Yalmy River flowing through forest. A small creek (6 m wide) with a boulder and clay bed. Riffles 40 cm deep with pools to 120 cm. Carries short-finned eel, long-finned eel, river blackfish, climbing galaxias and mountain galaxias. There is about 160 km of this river in Victoria, and all except the lower 10 km flows through mixed species forest. Most of the river is not accessible by conventional vehicle. There is no accommodation and there are very few camping sites along the Buchan/Gelantipy Road. Lightly fished because of its inaccessibility. There is spectacular scenery, with high bluffs and panoramic views and some tracks into the river. One of the largest wilderness areas in Victoria and with several areas classified as Natural Catchment Areas. Flows through forest in a broad valley flanked by high hills. Riparian vegetation of willows, wattles and pink bottlebrush. Predominantly sand substrate with some rock, rubble and gravel. River width varies from 30-40 m. Mostly riffles and runs, average depth 60 cm, with pools to 1-2 m. Deeper pools over 3 m and boulder and sand substrate at McKillops Bridge. Access by road to last few kilometres near the NSW border and at McKillops Bridge. Elsewhere access is difficult because of the distance of the river from the nearest road. Carries occasional brown trout, av. 350 g, max. 1.6 kg, some Australian bass, both species of eel, shorthead lamprey, congoli, abundant Australian grayling, abundant Australian smelt, and common galaxias. Some rainbow trout to 350 g reported to be present. Trout fishing is best in late summer and autumn and usually just upstream of the junction with the Deddick River. Last stocked with trout by Fisheries Victoria in 1978. 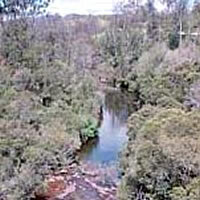 Flows through forest, with riparian vegetation of eucalypts, tea-trees and wattles. River width varies from 20-40 m with all types of water (riffles, runs and pools). Substrate is predominantly sand upstream and rubble /sand downstream but there is also, bedrock, boulders and extensive areas of rubble. Some sections have water depths of 60-100 cm while other sections have extensive pools over 300-400 cm deep. 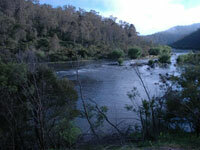 The river is about 10 km from the main road through the Snowy River National Park and is accessible only from tracks. Carries all species listed above as well as flathead gudgeon, southern pygmy perch and trout galaxias near Bruthen. The river flows for 20 km through forest and then into open flat farmland near Orbost. It is now up to 43 m wide with a sand substrate. Riparian vegetation is grass, red gums, wattles and willow on a steep bank. As part of the River Health Program, willow removal and bank fencing and re-vegetation is being carried out with the aim of restoring 75% of the original vegetation to 70 hectares of riparian land around Orbost. Eight reaches of the river have been designated as Environmental Water Reserves, and an extra 38,000 ML has been made available for them. An extra 174,000 ML is committed to these areas as it becomes available. Water is mostly runs (30-100 cm deep) and some pools to 3 m. Species taken in surveys are Australian bass, Australian grayling, estuary perch, congoli, short-finned eel, common galaxias and southern pigmy perch. The river flows through a flat flood plain with occasional large eucalypts along the banks. There is an extensive section of sedimentation just downstream from the Princess Highway resulting in fast flowing water up to 100 cm deep and a moving sand bed. This sand bar has moved progressively downstream into the top of the estuary. Recreational Fishing Licence revenuei has been used to construct instream habitat at Second Island. The lower reaches provide good fishing for estuary perch, black bream, flounder and yellow eye mullet and sea mullet during the summer. Other species commonly taken are Australian bass, trevally, luderick, congoli, tailor, both species of eel, Australian salmon and mulloway in some years. There are camping grounds at Orbost and Marlo and boat ramps at Marlo and the other end of Old Marlo Road into the lower Brodribb River. Lake Coringle, the lower Snowy River and the estuary downstream are all accessible by boat. The lower river and estuary, in the Marlo area, are usually very productive and are best fished by boat. Flows through forest, rubble bottom. Good native riparian vegetation and instream habitat. Width varies from 3 m upstream to 10 m in its lower reaches. Runs and riffles 30-50 cm deep with pools to 200 cm deep. Access is limited and difficult due to the terrain. Carries occasional brown trout to 900 g, river blackfish, congoli, abundant Australian grayling at times, mountain galaxias, common galaxias, Australian smelt and flathead gudgeon. An important spawning area for Australian grayling. Only lightly fished. Small fast-flowing stream in forested country, rock bottom. Carries some small brown trout. Inaccessible and lightly fished. Tributary of the Rodger River. A 10 m wide river flowing through forest. Predominantly riffles and runs to 80 cm deep, large gravel substrate. Limited access. Carries a good population of small river blackfish, mountain galaxias and both species of eel.